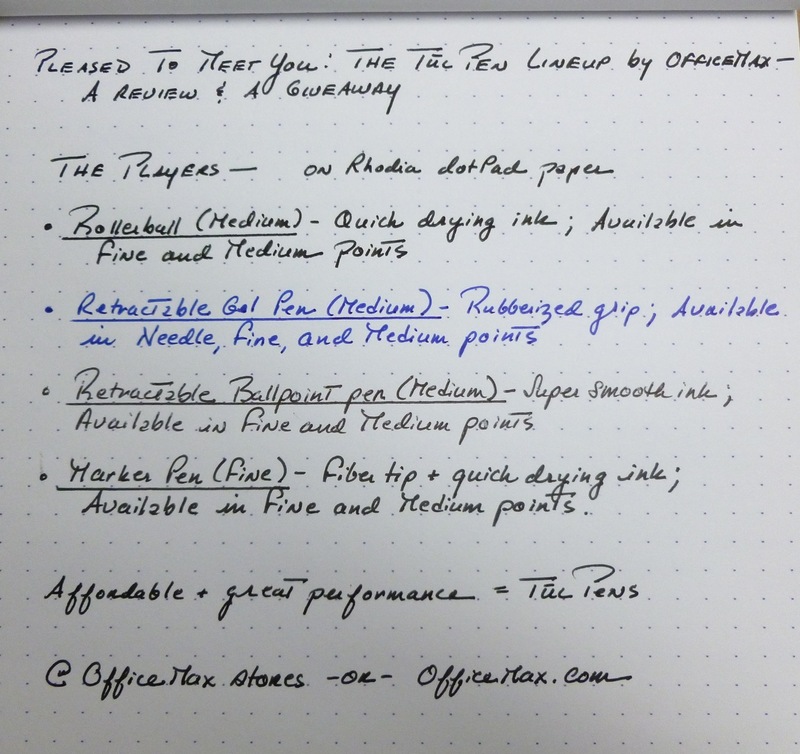 Pleased To Meet You: TUL Pens by OfficeMax- A Review AND a Giveaway! Our local OfficeMax store closed a number of years ago, and since then, I’ve lost touch with the brand. So when a representative offered to send me a set of the latest generation of TUL pens, I jumped at the chance, especially because the offer included an additional set to give away. I’ve been test-drivingwriting them for most of the week, and can wholeheartedly endorse the TUL line. To be honest, in the past I’ve shied away from store-brand pens because of performance issues, but OfficeMax’s TUL line changes that. All of the pens in this line are stellar performers, and easily match the quality of comparable Uniball, Zebra, Pilot, and Sharpie pens. TUL pens ARE the real deal. I’ve been particularly taken with the smooth dark line of the retractable ballpoint, which is tricky to get right, judging by the number of so-so ballpoints that are on the market. The super-affordable TUL ballpoint is the one that I’ve been reaching for since it arrived. The ink is just that good. The smooth rubber grip makes it easy to hold, and I really like the clean and simple lines of the pen. It’s minimalist in looks, but certainly not in performance. The fine-line marker pen, with its clear cap, dimpled black grip, and simple branding also appeals to me. No gimmicks, just a precise line that doesn’t feather or bleed. Very nice. The fiber tip feels quite sturdy, like it’ll easily hold up for plenty of sketching or note-taking. 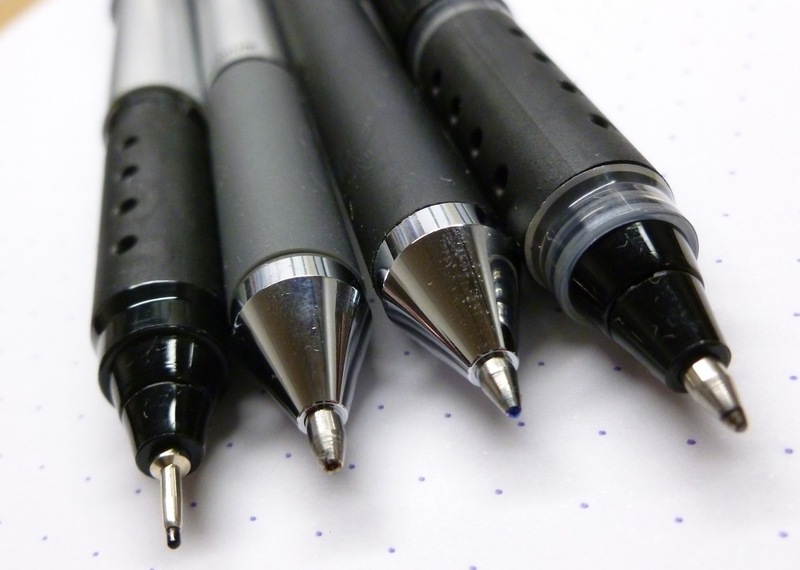 The retractable gel pen is very simple looking, with a black body matching the extra-long smooth black grip. Again, the gel ink writes great. No skipping. No smearing. No complaints. Same goes for the capped rollerball…the black liquid ink is perfect making bolder lines and bolder statements. Superior performance AND pricing. Great looks and super smooth inks. That’s TUL, by OfficeMax. Check them out at your local OfficeMax store or online. 1) Leave a comment on this blog by 11:59 PM Wednesday 10/31/12 (Halloween!). One comment per person, please! 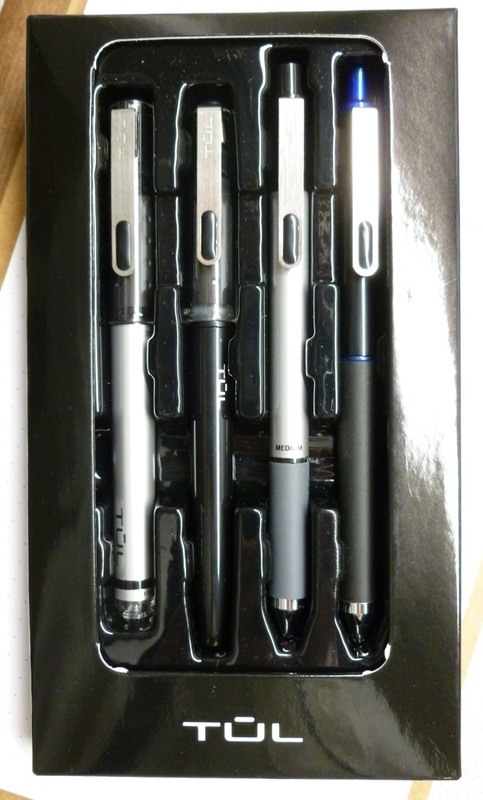 3) A random number generator will be used to select the winner of the set of all four TUL pens. The winner will be announced on this blog the evening of November 1st. OfficeMax will ship the pens to the winner directly. 5) GOOD LUCK! Hope you win this Halloween treat! TUL pens, I AM pleased to meet you. This looks like the start of something good. Disclaimer: I received the TUL products mentioned in this post from OfficeMax in order to facilitate my review. The items featured in this giveaway are also provided by OfficeMax and will be sent to the winner directly. Opinions expressed in this post are 100% my own. I have not been compensated for this post in any other way.